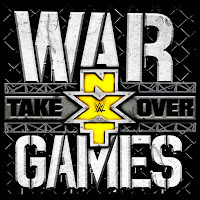 The Pre-show for tonight's NXT "Takeover: War Games II" opens live from the Staples Center in Los Angeles, California. Charly Caruso welcomes us. She's joined by Sam Roberts and Pat McAfee. We see fans filing into the arena and the panel hypes tonight's show. The panel talks about tonight's NXT Title match and we get a promo. McAfee believes The Velveteen Dream could go all the way tonight. Musician Nita Strauss joins the panel and talks about some of the happenings in NXT and tonight's card. We get a promo for the Aleister Black vs. Johnny Gargano feud now. We come back and Matt Riddle has joined the panel. He does a "bro!" chant with McAfee. Kassius Ohno interrupts and runs Riddle down, saying it will take him just one second to expose Riddle when they step in the ring. Riddle says he used to think Ohno was cool but now he sees he's just bitter. Their match is confirmed for Wednesday. We come back from a break and Sarah Schreiber is on the floor with a bunch of excited fans. We see the War Games cage hanging high above the ring. We come back to the panel for more talk on tonight's main event. That's it for the pre-show. We are in Los Angeles, California and your announcers are Mauro Ranallo, Nigel McGuinness, and Percy Watson. Matt Riddle makes his way to the ring and he has a mic. Matt says he is not scheduled to have a match on Takeover, but if you watched the Kickoff Show, a certain someone, a certain Kassius Ohno interrupted him. Matt says they are scheduled to wrestle next Wednesday, but we are chillin in LA and they have two rings. Riddle tells Ohno he will knock him out in both rings... BRO. Kassius Ohno comes out and he tells Riddle that he is too stupid to know that he isn't supposed to be out here. Riddle is too stupid to know that he is not ready for Takeover. He says that since there is a referee, let's have a match. He says that Matt will not remember this match after he knocks him out. Ohno charges at Riddle and Riddle with a jumping knee for the three count! After the match, Riddle celebrates as his music hits. Ohno can't believe what just happened as we get a replay. Riddle heads to the back. We get formal ring introductions from Kayla Braxton. The bell rings and Sane immediately decks Baszler and takes her to the corner. Sane with more offense, including a neckbreaker. Sane unloads with chops against the ropes. Sane charges in with a low forearm, sending Baszler to the floor to regroup. Sane runs off the apron with a flying elbow. Sane yells out for a pop. Sane brings it back into the ring but Marina Shafir and Jessamyn Duke attack Sane while Baszler has the referee distracted. Baszler enters the ring and applies the Kirifuda Clutch as Sane tries to resist. Sane taps out for the first fall. Fans chant "bulls--t" at the first fall. Baszler drops Sane again for another close 2 count. Fans chant for Sane as she tries to make a comeback. Sane gets dropped into another submission from behind but she finally makes it to the ropes to break it. Baszler keeps control and stomps Sane's face. Baszler stands tall and poses as fans boo. Sane finally makes a counter but Baszler kicks out at 2. Sane with another counter for a close pin attempt. Sane with a big kick and strikes into the corner. Baszler comes back with kicks. Baszler blocks strikes but Sane continues throwing them. They trade strikes now. Baszler stops it with a clothesline. Baszler charges but Sane hits her. They end up on the apron now. Sane counters a move on the apron and drops Baszler hard on the apron with a big DDT. Baszler falls to the floor and the Horsewomen check on her. Fans chant "holy s--t" now. Sane ends up going to the top while Baszler is down on the outside. Sane nails the big Insane Elbow, taking down the three Horsewomen at the same time. Fans chant for NXT now. Sane brings Baszler back into the ring and hits another big elbow drop. Sane covers for the second fall. Sane keeps control with Interceptors now, hitting three in a row. Sane drops Baszler with a spinning back-fist. Sane goes to the top but Baszler cuts her off. Baszler climbs up and they trade shots. Sane with headbutts. Baszler keeps fighting back. Baszler unloads with strikes while they're up top. Baszler tries for a super gutwrench but Sane slides down and turns it into a powerbomb for a close 2 count. Sane calls for the finish now. Sane slams Baszler. Duke gets on the apron to distract the referee, allowing Shafir to push Sane off the top. Dakota Kai runs down and takes out Duke and Shafir at ringside. They turn it around and double team her now. Io Shirai runs down now and goes to the top, nailing a moonsault to take down Duke, Shafir and Kai. Sane goes for the Insane Elbow but Baszler catches her on the way down and turns it right into a pin for the win to retain. After the match, Baszler takes the title and regroups with Duke and Shafir at ringside. Shirai and Kai check on Sane in the ring as some fans boo. We go to replays. The Horsewomen stand tall on the stage as the others look on. Baszler raises the title. - Back from a break and we see Sean "X-Pac" Waltman at ringside with his dog. - We see NXT Champion Tommaso Ciampa backstage warming up. - We get a video package for the Johnny Gargano vs. Aleister Black feud. We go to the ring and out first comes Johnny Gargano. Gargano hits the ring and talks some trash as he waits for his opponent. The music finally hits and out comes Aleister Black to a pop. He's wearing spikes or horns on his entrance jacket. The bell rings and they stare each other down from their corners. Fans are riled up with dueling chants. They meet in the middle of the ring and have some words. Gargano slaps Black and Black with a boot to the head followed by punches. Gargano sends Black to the floor and Gargano goes to the floor but Black moves. Gargano lands on his feet and Black with a kick. They return to the ring and Black misses a running boot and Gargano with a chop. Gargano with punches as he avoids punches from Black. Black misses a kick and Gargano rolls through and kicks Black. Gargano with a chop but Black misses a punch. Gargano with a punch. Black floats over and connects with a knee to the head. Black traps the arm and connects with a few knees and a series of kicks that sends Gargano to the floor. Black hits a quebrada into a seated position and Gargano with a drop kick. Gargano kicks Black in the corner. Black goes for a suplex and Gargano lands on his feet. Gargano with an O'Connor Roll for a near fall. Gargano with a rocking chair submission. Gargano goes for a rollup but Black blocks it and gets a near fall of his own. Gargano with an elevated elbow to the chest for a near fall. Gargano stomps on Black's hands. Gargano sends Black into the turnbuckles and punches him. Gargano with punches and chops. Black with forearms as he blocks punches from Gargano. Gargano floats over and misses a round kick. Gargano with a forearm and Black with a knee to the midsection. Black teases a dive when Gargano moves. Black with a kick to Gargano followed by a plancha. Black puts Gargano in the corner and connects with a series of kicks. Black with a leg sweep and quebrada for a near fall. Black goes to the turnbuckles but Gargano with kicks. Black with a waist lock and Gargano escapes. Black with a super kick and Gargano goes to the floor. Gargano moves when Black goes for a moonsault off the turnbuckles to the floor. Gargano wtih a suicide dive into a tornado DDT. Gargano with a slingshot DDT for a near fall. Black blocks a kick and hits a spinning back elbow. Gargano with an enzuigiri. Black and Gargano both go for clotheslines. Black misses round kicks but Gargano hits a reverse rana. Black with a flying knee to Gargano and both men are down. Gargano crawls between the rings and Gargano with a forearm. Black punches Gargano and Gargano fires back. Black with a boot to Gargano and then Black with a boot when Gargano goes for a slingshot spear. Black with kicks and a German suplex for a near fall. Black misses a kick and Gargano with a clothesline. Gargano with La Mistica into the GargaNo Escape. Black rolls Gargano up for a near fall. Gargano with a thrust kick and then he sets for the lawn dart and hits it. Gargano picks Black up using his boot and Black sets for a super kick. Black tells Gargano to wait a second and Black sits down to wait for the kick. Black avoids the kick and rolls Gargano up. Gargano with a super kick and running knee for a near fall. Gargano with forearms to Black. Black with a forearm and then they exchange forearms. Black with strikes to Gargano and then he hits a knee. Black goes for a springboard move and Gargano sends Black over the top rope to the floor. Gargano sets for a suicide dive and Black with a knee to the head. Black sends Gargano back into the ring and Gargano begs for mercy. Black picks up Gargano using his bott and then Gargano rolls up Black on Black Mass for a near fall. Gargano with GargaNo Escape and Black tries to get to the ropes but Gargano rolls back into the ring. Black with a rollup for a near fall. Black with a spinning knee to the head. Black pulls down the knee pad and hits a jumping knee and then he picks up Gargano with his foot and he hits Black Mass. Black holds Gargano and he tells Johnny it is over and he hits Black Mass for the three count. After the match, Black sits up and gets to his feet as the music plays. We go to replays. Black stands tall and yells out. - The Undisputed Era is in the locker room discussing something too quiet for the mics to pick up. We go to the ring and out first comes the challenger, The Velveteen Dream. NXT Champion Tommaso Ciampa is out next. We get formal ring introductions from Kayla as fans start chanting for Dream. They lock up and Dream almost sends Ciampa over the top rope but Ciampa stays in the ring. Dream pushes Ciampa and poses on the break. They lock up and Ciampa with a waist lock and take down. Dream with a switch and he rides Ciampa and slaps him in the head. Dream backs Ciampa into the corner and CIampa messes with Dream's hair. Dream slaps Ciampa. Ciampa with a kick and Dream gets away from Ciampa, but the head band is not so lucky. Dream goes to the floor. Dream grabs Goldie and Ciampa grabs her before returning to the ring. Dream with a front face lock and Ciampa escapes. Dream with punches. Dream grabs his head band on the Irish whip and punches Ciampa and slams him. Dream with a standing drop kick and he leaps over the top rope and drops Ciampa on the top rope. Dream with a double sledge off the turnbuckles and the head band is back on its rightful forehead. Dream with a big boot and then he sets for the leg drop of Dream but Ciampa goes to the floor. Dream comes off the turnbuckles and hits a double sledge to the floor. Dream goes for a springboard move but Ciampa knocks Dream off the ropes to the floor. Ciampa with a swining neck breaker on the floor. Ciampa sends Dream back into the ring and punches the challenger. Ciampa with kicks and then he hits a running knee into the corner. Dream has trouble getting back to his feet and looks groggy from the knee. Ciampa with a punch to Dream. Ciampa with a neck breaker and Dream hits the top rope and falls to the floor. Ciampa pats himself on the back before he goes to the floor. Ciampa puts Dream on top of the announce table and Ciampa with a running knee to the head. Ciampa sends Dream back into the ring and kicks Dream in the head. Ciampa with a reverse chin lock and snap mare into another reverse chin lock. Ciampa tries to choke out Dream. Ciampa with a knee to the midsection. Dream with a back slide for a near fall. Dream with punches and he hits a neck breaker. Dream with punches and chops as he uses his reach advantage. Dream with a flying forearm and punch. Dream with a running forearm. Ciampa with a knee and Dream with the finger point. Ciampa goes for an O'Connor roll but Dream holds on to the ropes. Dream with punches and a big boot followed by a Leg Drop of Dream and a second one. Dream with a third leg drop and he gets Ciampa on his shoulders but Ciampa gets back to his feet and pushes Dream away. Dream with a spinebuster for a near fall. Dream with a punch and Ciampa goes to the apron. Dream knocks Ciampa off the apron and Dream hits a pescado onto Ciampa. Dream goes up top but Ciampa rolls to the other side of the ring. Ciampa sends Dream to the floor. Dream slams Ciampa's injured leg into the apron. Dream with a punch. Dream goes for a figure four around the ring post. Ciampa taps while in the hold but the referee did not see it. Ciampa with an inside cradle for a near fall. Ciampa with a punch but Dream with a rollup into a figure four leg lock. Ciampa rolls over to reverse the hold but Dream rolls back to the original position. Dream and Ciampa with punches. Dream with a boot to the head and he gets a near fall. Ciampa kicks Dream into the guardrails. Ciampa brings Dream into the ring and goes for a suplex but he cannot get Dream up due to the damage done on the leg. Dream suplexes Ciampa over the top rope to the floor and Dream falls to the floor as well. Ciampa holds his lower leg and unties his right boot. Dream sends Ciampa back into the ring before the ten count. Ciampa punches Dream and Dream punches back. They add kicks to the exchange. Dream almost hits the referee on a super kick and Ciampa with a rollup but the referee sees Ciampa holding the tights. Dream with a super kick and rolling Death Valley Driver for a near fall. Dream rolls through and gets Ciampa on his shoulders. Ciampa escapes and hits a forearm to the back of the head. Dream comes off the turnbuckles and Ciampa with a flying knee for a near fall. Ciampa with Project Ciampa for a near fall. Ciampa goes to the floor and he takes Goldie and he brings it into the ring. The referee takes the belt and Dream with a rollup for a near fall. Dream with a swinging DDT onto the title belt but Ciampa kicks out. Dream goes up top and Ciampa gets his boot up. Dream goes for the figure four but Ciampa kicks Dream to the floor. Ciampa with a hanging DDT for a near fall. Ciampa removes his boot and then he pulls the mats up to expose the floor. Ciampa with punches and then he sets for an elevated DDT onto the floor but Dream gets to his feet on the floor and they go over the announce table. Dream hits a Death Valley Driver on the floor and hits an elbow drop for a near fall. Dream goes up top and tries for an elbow drop onto Ciampa on the apron but Ciampa moves and Dream hits the floor. Ciampa rolls Dream into the ring and he hits a handing DDT on the metal between the rings. Ciampa gets the three count. After the match, Ciampa is laid out on top of Dream as his music hits. We go to replays. We come back and Ciampa is still down on top of Dream. The referee hands him the title and he clutches it, laughing. Ciampa talks some trash and kisses the title before getting back up to his feet. Ciampa raises the title and looks down at Dream before leaving the ring. Ciampa makes his exit but stops to tell the cameraman that he's the greatest sports entertainer of all-time. - Mauro leads us to a look at the Team NXT vs. Team WWE League of Legends video game battle on Xavier Woods' UpUpDownDown YouTube channel. - We see Nita Strauss at ringside as the announcers plug her new album. - Nigel plugs Triple H's post-Takeover interview on Facebook with Cathy Kelley. - The sirens start going off inside the Staples Center as the War Games cage is lowered around the double-ring. We get a video package for tonight's main event. The bell rings and Cole stands in one ring while Ricochet is in the other. They talk trash and taunt each other. Ricochet enters Cole's ring and Cole attacks him, taking it to the corner. Ricochet turns it around and unloads, nailing an uppercut. Ricochet with a big chop against the ropes. Ricochet ends up taking Cole over with a headscissors. Ricochet with a dropkick now for a pop. Ricochet keeps control for a few minutes. Ricochet goes for a flying back elbow from the second rope in the corner but Cole catches him in mid-air with a Backstabber. Cole keeps control and mounts Ricochet with strikes now. Cole with a neckbreaker. Cole with more offense, dropping Ricochet in the middle of the ring again. Cole tosses Ricochet to the mat and keeps him down, dropping knees and driving knees into the back. Cole uses the middle rope to choke Ricochet now, putting his face in the steel and talking trash. Ricochet fights back but Cole kicks him down to one knee. Ricochet with a kick to the head to avoid a backdrop. Ricochet puts boots to Cole now. Cole rolls over into the other ring. Ricochet runs and jumps up to the corner of his ring, springboarding over into the other ring with a flying European uppercut to take Cole back down. The timer goes off as fans count down. Kyle O'Reilly is let out to join the match. O'Reilly hits the ring and Ricochet meets him but Kyle gets the upperhand with open-palm strikes. O'Reilly with knees and more strikes on the mat. O'Reilly checks on Cole and turns back to Ricochet as the double team begins. Ricochet ends up fighting off both opponents but O'Reilly takes him down with a Dragon Screw leg whip. Ricochet goes down clutching his knee. Cole drives knees into Ricochet now. O'Reilly follows up and levels Ricochet with a kick. Fans try to rally for Ricochet and he starts mounting offense. They turn it back around and Cole drives Ricochet down into his knee and O'Reilly's knee at the same time. The timer goes off again and Pete Dunne looks to leave the cage but The War Raiders stop him and Hanson runs down to the ring. Dunne doesn't look happy. Hanson hits the ring and unloads on Cole and O'Reilly. The big man overpowers and moves around with shots to both opponents. Hanson hits a bunch of running clotheslines in the corners to both Cole and O'Reilly. Fans go wild as he continues the running clotheslines from corner to corner. Hanson stands tall and raises the horns. Hanson with a big Bronco Buster to both opponents at the same time. Ricochet and Hanson team up now. Ricochet jumps off Hanson's back and hits a Shooting Star Press to O'Reilly as fans pop. More back and forth between everyone now. The timer goes off and Roderick Strong is out next. Strong hits the ring and unloads. Strong with a big dropkick to Ricochet and chops to Hanson in the corner. Strong with a jumping knee in the corner to Ricochet. Strong with two Uranages to Ricochet and another big move over the knees as fans pop for the sequence. Strong uses Ricochet as a missile and goes to work on Hanson. Hanson catches him in mid-air and tosses him. The Undisputed Era ends up triple teaming Hanson to shut him down. Fans chant "Undisputed!" now. They all take turns on Ricochet and Hanson now, keeping them down on the mat and in the corner. The timer goes off again and Dunne fights a bit with Rowe as their cage is opened. Rowe gets out first and runs to the ring. Rowe unloads on all three opponents and hits a big suplex to Strong. Cole makes the save for O'Reilly but Rowe levels Cole with a big knee. Kyle jumps on Rowe's back with a hold. Cole comes over but Rowe chokeslams him, while Kyle is still on his back. Rowe ends up slamming Strong and O'Reilly with a powerbomb - powerslam combo at the same time. Cole is the only one standing now as they stare him down. Ricochet sends him into The War Raiders and they launch him into the steel of the cage. Hanson and Rowe take turns on Cole in the corner now. Ricochet with chops to Strong in the other corner. The timer goes off and it's time for Bobby Fish to be let out. Fish leaves the cage and goes over to lock Dunne in his cage. Fish pulls Dunne into the cage bars and lays him out. Fish sabotages the lock and takes the key, making sure Dunne can't get out. Fish taunts Dunne as he's down. Fish launches the cage key into the crowd. Fish goes to the ring and starts handing steel chairs in from under the ring. Fish nails Hanson with a chair as he struggled with Fish. Fish and O'Reilly with chair shots to their opponents. Cole and Strong join in with chair shots to the others. Mauro points out how War Games can't officially start until Dunne has entered. The Undisputed Era destroys their opponents now. Hanson gets driven into the steel. Rowe gets driven down into a chair that was set up. Ricochet was also beaten down. They launch The War Raiders into the steel of the cage again. They stomp away as the timer counts down again. It's time for Dunne to be let out. A referee has found another key but he says it's not working. Another referee is going for help it appears. The Undisputed Era continues to control things down in the ring. Fans chant "Bruiserweight" for Dunne. Strong and O'Reilly take Hanson to the top. Strong superplexes Hanson from one corner while Fish superplexes Rowe from the top in the other ring. Cole talks trash about how they run the show, looking up at Dunne. Another referee brings out bolt cutters as Dunne gets ready to rush the ring. The lock is broken and here comes Dunne. The cage door is shut and they're keeping him from getting in. He grabs a kendo stick from under the ring, hitting Fish and O'Reilly. Dunne opens the door but here comes Cole. Dunne smashes Cole's hand on the steel steps with the stick. Strong comes over but Dunne fights him, slamming the door into him. Dunne throws the kendo stick in the ring. Ricochet nails a crossbody to take out his opponents. Dunne throws a trash can full of weapons into the ring, and another trash can. Dunne goes back under the ring for a table as fans pop big time. Dunne slides the table into Rowe. Ricochet and Hanson keep their opponents down. Dunne slides another table in the ring. Dunne brings another stick in and enters the cage. War Games has officially started. Dunne enters and unloads on his opponents with kendo stick shots. Ricochet also uses a kendo stick on the others. Dunne sends O'Reilly to the steel partition between the ring. Dunne works on the hand and wrist, then stomps on it on the steel partition. Ricochet smacks O'Reilly with the kendo stick. Dunne works on O'Reilly's hand some more. Dunne slams Strong on top of O'Reilly. Cole comes back and launches Ricochet into the steel after a knee. O'Reilly gets a chair kicked into his head by Hanson. Hanson puts a trash can over Cole's head. Rowe grabs Hanson and rams him back onto Cole with the can on him, smashing him into the turnbuckles. Rowe scoops Hanson and slams him on top of O'Reilly on the steel partition. The War Raiders double team Strong now and hit a huge clothesline. Hanson with a 2 count on Strong as Fish makes the save. They go for the same double team clothesline but O'Reilly slams a trash can into Hanson's face. Fish and O'Reilly work on The War Raiders now. Strong drops Ricochet over his knees and Cole follows up with a Backstabber to Ricochet. The Undisputed Era surrounds Dunne now. He stands up and starts fighting them off. Dunne sends Cole flying with a forearm. He takes out the others for a pop. Dunne drops Fish into a kneebar. The referee checks on Fish as Dunne stretches the injured knee. O'Reilly breaks it up to make the save. O'Reilly nails Dunne with a chain. O'Reilly wraps the chain around Dunne's hurt ankle now. Dunne counters and applies the Kimura with the chain. Fish breaks it with a steel chair shot to the arm. O'Reilly with a submission to Dunne now. The Undisputed Era keeps The War Raiders and Ricochet from saving Dunne from the submission. Strong joins in and works over Dunne while the submission is still locked. Ricochet comes flying over to make the save. Strong with a chair to the gut of Ricochet. Hanson is the only one standing now. Hanson takes O'Reilly to the top of one corner while Rowe takes Strong to the other. Cole drops Hanson from behind. Dunne levels Fish with a big kick to the face. Dunne climbs up to Strong while Ricochet climbs up to O'Reilly. They hit in-stereo hurricanranas for a pop. Ricochet covers O'Reilly but he kicks out at 2. All eight Superstars are down now. Cole gets up first. Cole climbs the cage to escape. Ricochet meets him at the top and they brawl. Strong comes up and they look to push Ricochet off but it backfires. Dunne also gets involved. Dunne looks to try and suplex Cole to the mat. O'Reilly climbs up and assists Cole. Rowe climbs up to assist Dunne. Fish comes over to help Cole and O'Reilly. This just leads to a massive seven-man superplex - powerbomb combo from the top rope to the mat. Ricochet watched from the top of the cage. Ricochet stands straight up on top of the cage now as fans cheer him on. Ricochet nails a huge double rotation moonsault from the top of the cage, landing on everyone else down below. The crowd pop big and we get a replay. Both teams recover and look on from their own ring as the crowd cheers them all on, chanting for NXT. The two teams meet at the partition and talk trash. They step between the rings and start brawling with each other again. We're back to most everyone down. Fish and Rowe go at it. Rowe with a big knee to the face. Hanson goes to the top and hits a big leg drop on Fish as Rowe held him. O'Reilly grabs Rowe and Strong launches in with a kick. Hanson takes out Strong and O'Reilly with a handspring double back elbow. Ricochet ends up springboarding at Cole and taking him out. Dunne unloads on Cole now. Cole counters and spikes Dunne with a DDT. Cole with more big offense to Dunne for a close 2 count. Cole exposes his own knee but Dunne ducks. Dunne drops Cole on his head and Ricochet flies with the 450 in for the follow-up on top of Cole. Dunne covers for the pin to win while Ricochet also has his arm on Cole. After the match, Dunne and Ricochet start getting up first after a minute or so. They clutch their titles over Cole and stand up over him. They have a show of respect and we go to replays. We come back to Dunne and Ricochet posing with their titles on top of the structure. Dunne takes a look at Ricochet's title and Ricochet nods. They don't show much of The War Raiders but they are also up to their feet by now. The Undisputed Era is still down. "Takeover: War Games II" goes off the air with Ricochet and Dunne standing on top of the cage.